George Wildman - Popeye #101, Complete Story Original Art, Group of 5 (Charlton, 1970). This lot consists of five stories, including two seven-page Popeye the Sailor stories ("Tall Tail," and "Goon Balloon"), two Wimpy stories (the three-page, "Coo Coo Cook," and the five-page, "Hamburger Slamburger"), and a four-page O. G. Wotasnozzle story, "Baby Sitter." 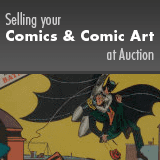 Each page has an image area measuring 10" x 15", and the items average in Very Good condition. Also includes a photocopy of the Popeye #101 cover line illustration by George Wildman.